This bloodtrail is 100% real. 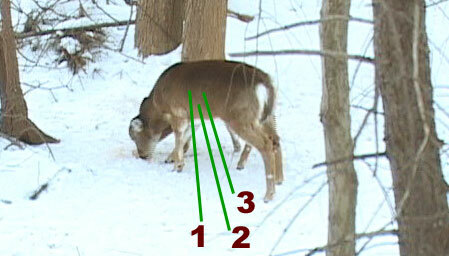 All the pictures and steps are as it happened during a recent Connecticut Deer hunt in January, 2005. Good Luck! A half hour before legal sunset this deer comes in to browse. Answer the first question below based on the photo. Choose the best shot angle?